This week’s Poker After Dark theme is MMA, and three of the UFC’s biggest names will be trying to submit three top poker pros. 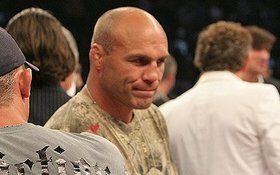 Representing the UFC will be 5-time Champion Randy Couture (2-time light heavyweight, and 3-time heavyweight); former Pride and UFC Champion Dan Henderson, the only man to hold the championship belt in two different weight classes at the same time; and “The Voice of the Octagon” Bruce Buffer, who has shown some skill in poker over the years, recently cashing in the WSOP Main Event. On the other side will be Erick Lindgren, Howard Lederer, and Patrik Antonius. All three are PAD veterans, and Lederer will be seeking a record-tying 4th PAD win –which would tie Johnny Cahn. Antonius has one PAD win to his credit, and Lindgren has been shutout in his 6 appearances on the popular show. This entry was posted on Tuesday, August 17th, 2010 at 12:23 pm and is filed under Poker News. You can follow any responses to this entry through the RSS 2.0 feed. You can leave a response, or trackback from your own site.